All front wheel drive and independent rear suspension cars utilize a CV axle to deliver power from the engine to the wheels. These CV axles have a six balls inside a CV joint that acts as a universal that allows extreme movement while delivering smooth rotational energy. 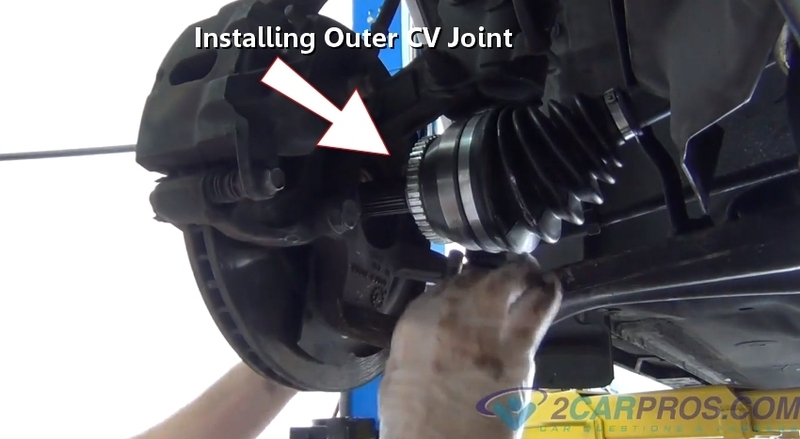 There are two ways a CV axle will go bad. The first is the boot will tear allowing the grease to leak out causing the joint to go dry and lose its lubricant which will make the joint to lock up and vibrate. The second way a CV axle can fail is to break causing the car to stop moving. You can get an CV axle from Amazon or the local parts store for between $50.00 and $80.00 (US). When taking the car in for a CV axle replacement repair you can expect to pay between $225.00 and $320.00 (US) depending on manufacturer. There is a video at the bottom of this guide showing this job being done. You will need to jack the car up using a floor jack and support it on jack stands. You will then need to remove the wheels and then reinstall them once the job is complete. 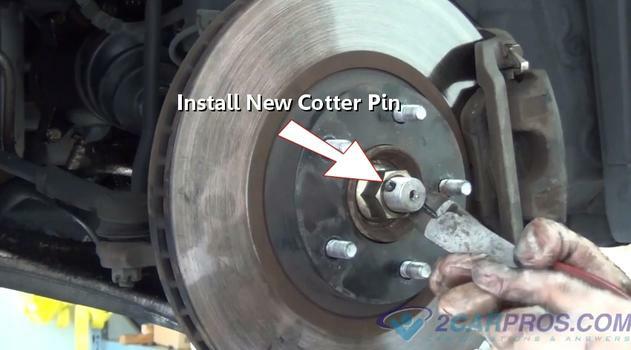 On most car's there will be a cotter pin that secures the outer axle nut from coming off of the CV joint. Use a pair of side cutters (dikes) to remove the cotter pin from the axle snout. There might also be a star wheel which can be removed after the cotter pin. 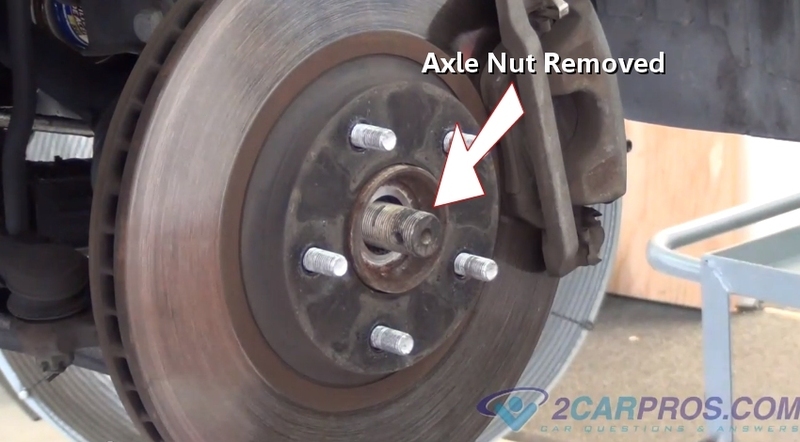 There are three methods that can be used to loosen and remove the axle nut. The first way is what is shown by using an impact wrench which just happens to be the easiest. 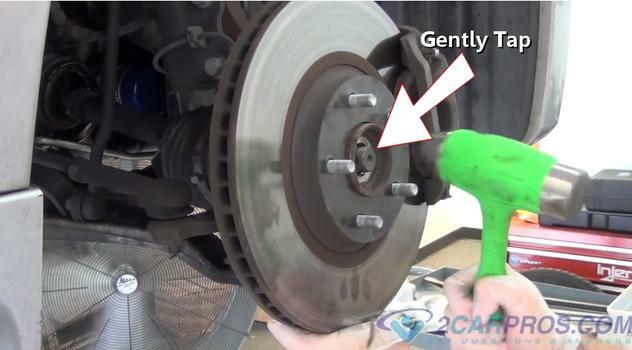 The next method is to have someone hold the brakes on while using a breaker bar to keep the axle from turning. The last method is to have the wheel on and touching the ground before you raise the car up with the floor jack and then loosen the nut. 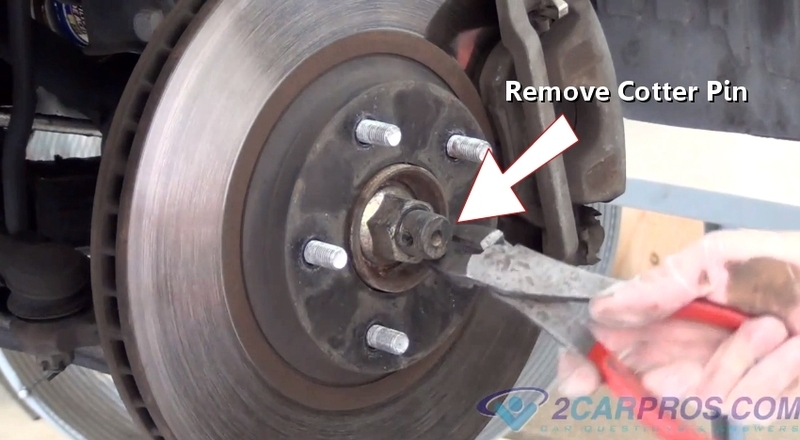 You will need to reverse this method to tighten the nut once the job is complete. This is what it looks like with the axle nut removed. Now the axle joint will be loose within the bearing hub splines. 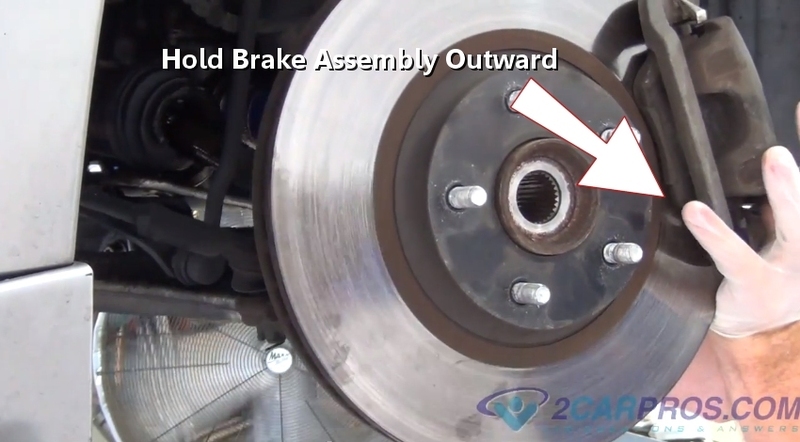 The lower control arm will need to be disconnected to allow the strut to be pulled out enough to get the axle CV joint out of the bearing hub. 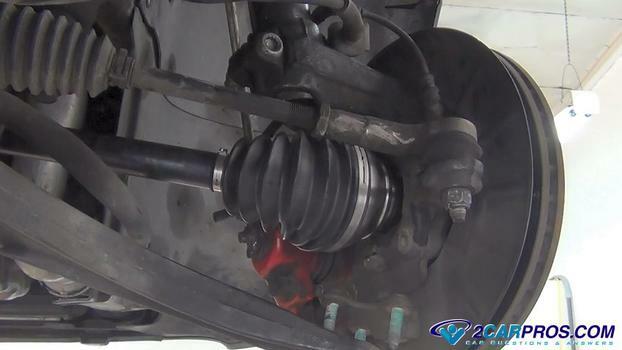 To do this you must undo the lower ball joint allowing the room for the axle removal. 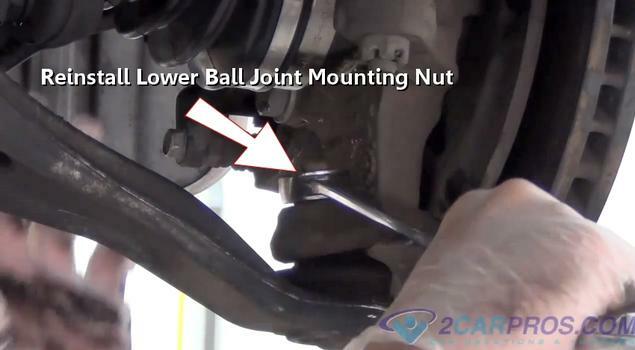 The ball joint nut may or may not have a cotter pin that must be removed to disconnect the ball joint. A ball joint nut that does not have a cotter pin is self locking which will hold itself in place so a cotter pin is not needed. 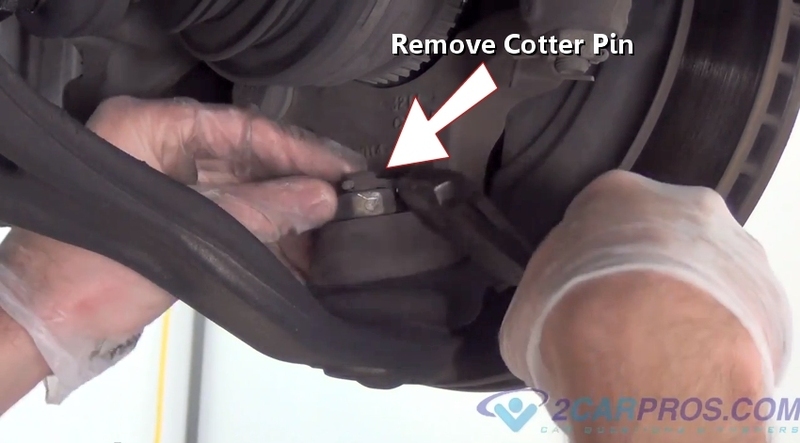 If a cotter pin is present then use a pair of dikes to remove the pin from the ball joint. Now that the lower control arm is loose pull the spindle outward from the car at the same time use a hammer and gently tap the end of the CV joint snout. This will force the axle out from the wheel hub spline. This step should be fairly easy, if the axle seems stuck use WD40 on the spline and let it sit for the few minutes before continuing. This will loosen any rust that is present in the spine area. Don't worry about damaging the snout threads because the axle will be replaced anyway. If you will be reinstalling the axle install the nut onto the axle threads three turns to offer protection to the threads. This is how you will hold the spindle when removing the CV axle. 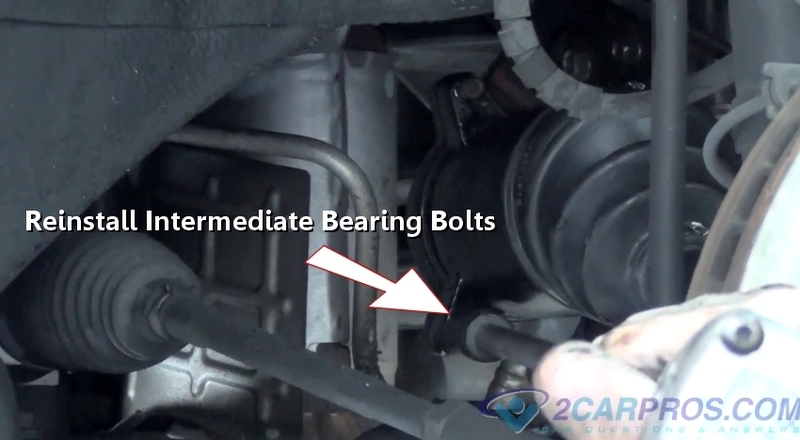 Some cars will have an intermediate bearing mount that will need to be unbolted to remove the axle. Use a 12mm or 14mm socket or wrench to remove these bolts. If the car does not have this bearing use a large pry bar and wedge it between the transmission case and the axle and pry outward. 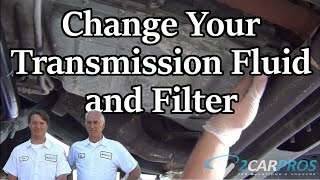 This will pop the axle out from the transmission and enable you to remove the axle. Grasp the axle firmly while holding the spindle outward and pull the axle out from the transmission. 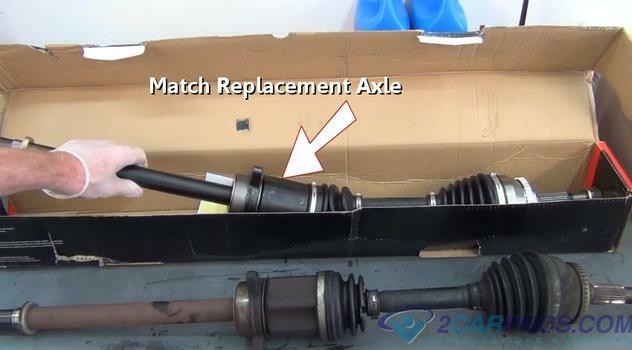 Match the new replacement axle to the old unit you just removed, they should match identically. Put the old axle in the box so you can return the core for credit if any is due. 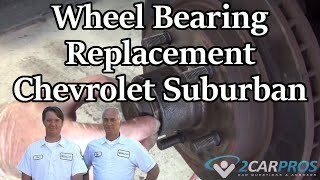 Tip: Make sure if the old axle has an ABS stator ring ont he outer CV joint that the new axle has one as well or the ABS system light will be on once the job is complete. 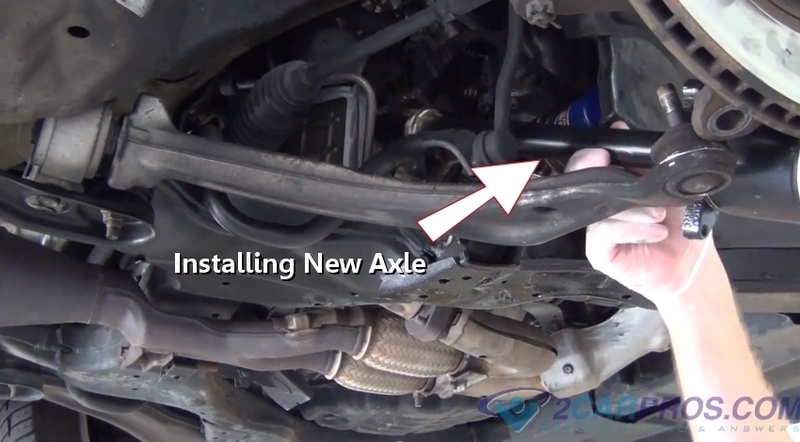 Grasp the new axle firmly and feed it back into the transmission being careful not to damage the transmission seal. The axle will need to be popped into the transmission with a forward thrusting motion. It might take a small amount of jostling to get it completely in the transmission but hang in there until the axle in fully installed. 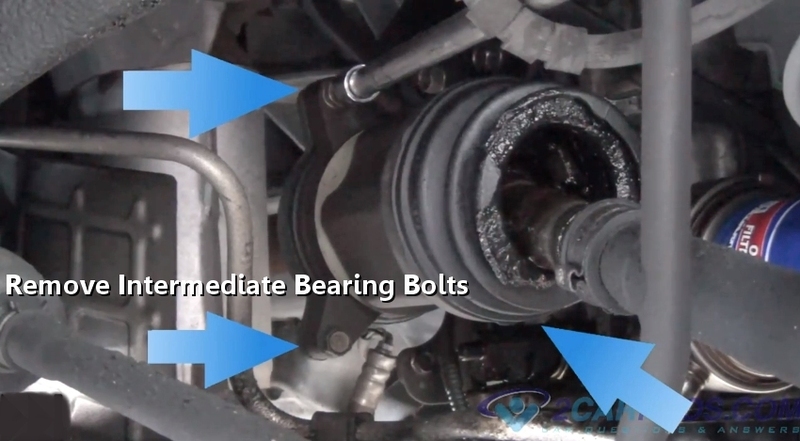 If the axle is not completely installed it will pop out while driving causing the car to come to a stop. If so equipped reinstall the intermediate bearing mounting bolts and tighten them to manufacturer's specification which is usually 22 to 24 foot pounds of torque. Now feed the CV joint of the axle into the outer bearing hub. You may need to spin the hub to align the spines of the axle and fit the joint snout into the hub. While holding the lower control arm down maneuver the lower ball joint stud into the spindle and then force the control arm upward to install the ball joint nut. Use a large wrench to tighten the nut fully. It might be difficult to get a torque wrench on the nut so you will need to judge its tightness to about 55 foot pounds of torque and then reinstall a new cotter pin if required. Reinstall the CV joint axle nut by hand to avoid cross threading and then tighten to manufactures specification with is usually between 120 and 140 foot pounds for torque. Install a new cotter pin and then bend one end if it over the axle threads to hold it in place while cutting off any excess and you are all set. 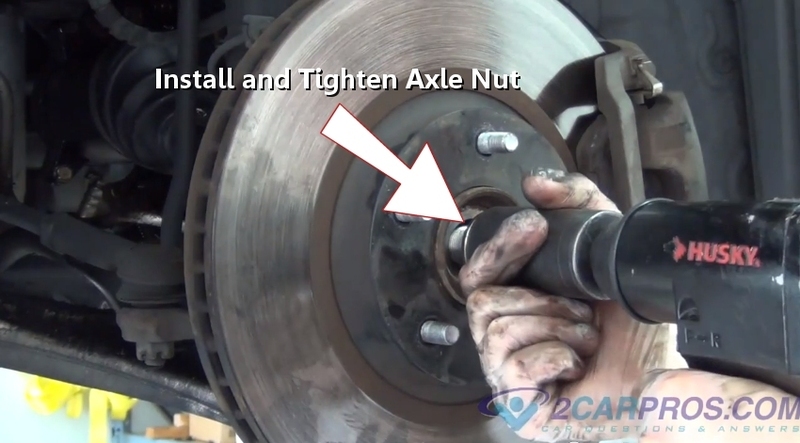 Reinstall and torque the wheel while safely lowering the car off the jack stands. When first driving the car, listen for any strange noises which means the job will need to be rechecked.